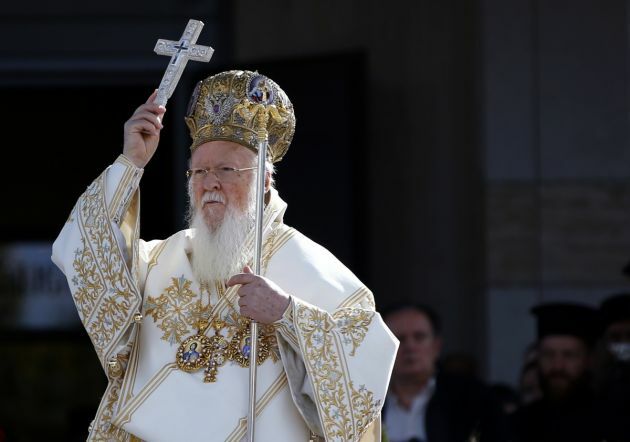 (Photo: REUTERS / Marko Djuricah)Ecumenical Orthodox Patriarch Bartholomew I holds a liturgy to mark 1,700 years since the Edict of Milan, when Roman emperor Constantine issued instructions to end the persecution of Christians, in the southern Serbian city of Nis October 6, 2013. Nis, some 220 km (137 miles) south of Belgrade, is the birthplace of Constantine the Great, the first Roman emperor to convert to Christianity. The Edict of Milan, which he had a part in enacting, proclaimed official tolerance of Christianity across the Empire. "Christians and Muslims have lived together, sharing the same geographical region, in the context of the Byzantine and the Ottoman Empires," he said in a speech at the Eurasian Economic Summit in Istanbul on Thursday. He said the historical models, Bartholomew said, reveal "possibilities in our own world, which is shaped by pluralism and globalization." "This is precisely why a dialogue, which acknowledges differences but also suggests ways to negotiate differences, may prove helpful to map out appropriate avenues of communication. "It is the only way of discovering the peace," noted the Ecumenical Patriarch. "If our age will be remembered at all, it may be remembered for those who dedicated themselves to the cause of peace. "We must believe in and 'pursue what makes for peace'," said Bartholomew quoting from the letter of St Paul to the Romans (14.19). "As faith communities and religious leaders, we are obliged constantly to remind people about the obligation and responsibility to choose peace through dialogue," said the Ecumenical Patriarch. Among the topics addressed at the 17th Eurasian Economic Summit were: "Human Trafficking", "the Future of Economy and Energy from Local to Global on Silkroad," "Sustainable Development and Change in the Local Government", "the Importance of Peace: Dialogue from Local to Global", "Development and Design" and "ICT for Development."